Jacquelyn graduated with her Bachelor of Science in Biology in 2009 from George Mason University. She continued her education at Old Dominion University where she obtained her Doctorate of Physical Therapy in 2012. As a student, she experienced many settings to include inpatient rehabilitation, acute inpatient, outpatient neurological rehabilitation and, her passion, outpatient orthopedics. She began her career with Alliance, working in our Woodbridge office after graduation. In 2016, she transitioned to our Stafford office as Clinical Director. 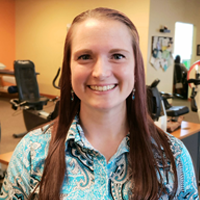 Jacquelyn has completed continuing education to facilitate her manual treatment skills with particular focus on the shoulder, neck and back. She is proficient in Functional Capacity Evaluations and work hardening/conditioning programs to assist the injured worker's safe return to the job. Outside of work, Jacquelyn enjoys spending time her husband and two small boys, hiking, scuba diving, beach vacations and video games.